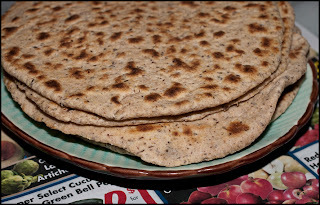 This is an interesting flatbread recipe that uses a mixture of whole wheat and barley flours. Because of the whole grain flours, these are denser than pitas or tortillas, but they're really flavorful. I recommend eating these soon after making them, while they're still warm. I served them with vegetable soup, and it was a really good combination. I love how easy it is to make flatbread! I really should buy some buckwheat flour.